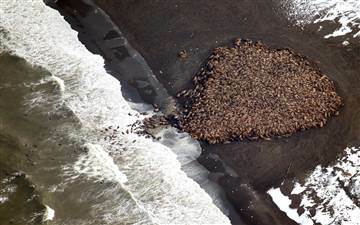 An estimated 35,000 walruses were spotted about 5 miles north of Point Lay, Alaska, on Sept. 27 by scientists on a survey flight. The U.S. Fish and Wildlife Service (FWS) requested that pilots fly at least 2,000 feet above the walrus herd and a half mile away from it. Helicopters were asked to fly 3,000 feet above and a mile away from the walruses, who were forced to swim to shore due to the lack of the sea ice that normally provides resting areas this time of year. No flights had been rerouted away from the beach, as some outlets previously reported, the Federal Aviation Authority told NBC News. The request from the FWS warned that walruses are sensitive to engine noise — a problem when planes fly low to get a better look at the animals — and aircraft could cause them to stampede. “This big group at Point Lay is mostly cows with calves, and when they stampede, they tend to run over the calves,” James MacCracken, supervisory wildlife biologist at the FWS regional office in Alaska, told NBC News. Today only four indigenous tree species grow on the large island, confined to small areas in the south. Three-quarters of Greenland, the world’s most sparsely populated country, is covered by a barren ice sheet. Research showed that with expected levels of warming, a majority of 44 species of North American and European trees and bushes will be able to thrive in Greenland. The transformation is likely to alter Greenland’s ecosystem, leading to the loss of Arctic animals and plants. On the other hand there could be significant commercial possibilities linked to forestry, agriculture and tourism.